Are you looking for a quick summer read to take you on an edge of your seat ride around the solar system? 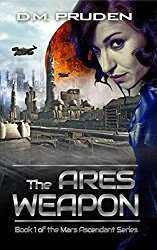 The Ares Weapon by D.M. Prudens might be a good choice for you. Full disclosure – I picked up The Ares Weapon for free by signing up to an Instafreebie campaign with an ulterior motive: to learn what the heck this Instafreebie thing was and how authors were using mailing lists. I also want to start reading more books by indie authors (probably a good idea since I plan on becoming one), so – two birds. There were a bunch of books in the campaign. You might ask why I choose this one and not others? Honestly, the cover. I signed up for another book (still to be read), and the covers were the best of the bunch. A lot of the other books had covers that I felt were poorly done, which meant I scanned past them. This one grabbed my attention enough to read the description, which was engaging. It highlights the importance of a good cover – some of those other books might have been great, but I didn’t get a copy. Oh, another reason I was interested in that particular Instafreebie campaign was because I want to start reading more science fiction and space opera, and this one fit the bill for science fiction. I’d categorize it as a realistic scifi thriller…that’s a category, right? In the end I liked this book a lot more than I expected, which I understand might be a strange way to start my comments . However, I’m a die-hard in the printed book camp. More often than not, I’ve disliked the ebooks I’ve read, both indie and traditional, and wondered for a while whether it was the format. This book made me realize that this maybe isn’t the case – I can enjoy a fiction ebook that’s not about Flavia de Luce, even if I might still prefer print. The main character is a strong, but certainly not perfect, female lead who didn’t come off as bitchy. I appreciated that balance. The book was easy to read and engaging. I found the plot drew me forward to the final climax. I liked that it’s set in a fairly realistic future (from my non-astrophysicist perspective), and the settings seemed plausible, though there were times when these could have been developed a bit more. Although it might not have been super deep or multi-layered, the story was well-crafted, which allowed me to easily lose myself in it. There were a couple of typos (but that’s my day job), and there were a couple of times when the main character seemed a little too obsessed with her, um, assets, but overall, I liked it. Check out the author’s website or his Amazon page.